This planned unit development townhouse style home features a 1 bedroom loft upstairs, a large open living room with vaulted beamed ceiling, a freestanding fireplace, kitchen and back patio. The bedroom/loft has a walk-in closet and a bathroom with shower/tub combo. The community swimming pool is always ready for hot summer days, and the spa for those of you who prefer hot water! This unit has assigned parking and the community also has two tennis courts and on site laundry rooms. 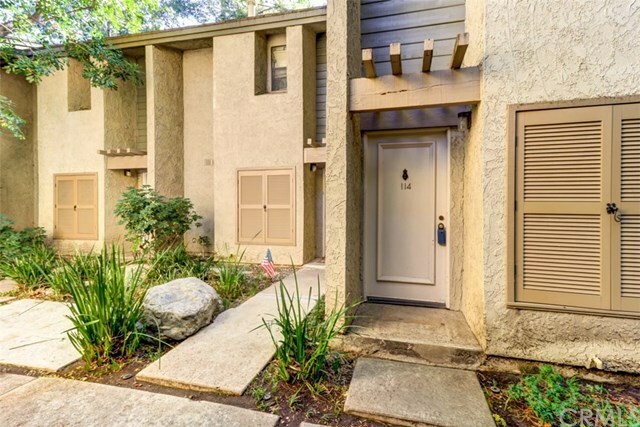 The Orange Lakes community is just minutes from Old Towne Orange, Chapman University the 55 freeway or the toll roads. You'll enjoy plenty of shopping, restaurants and entertainment in the City of Orange.